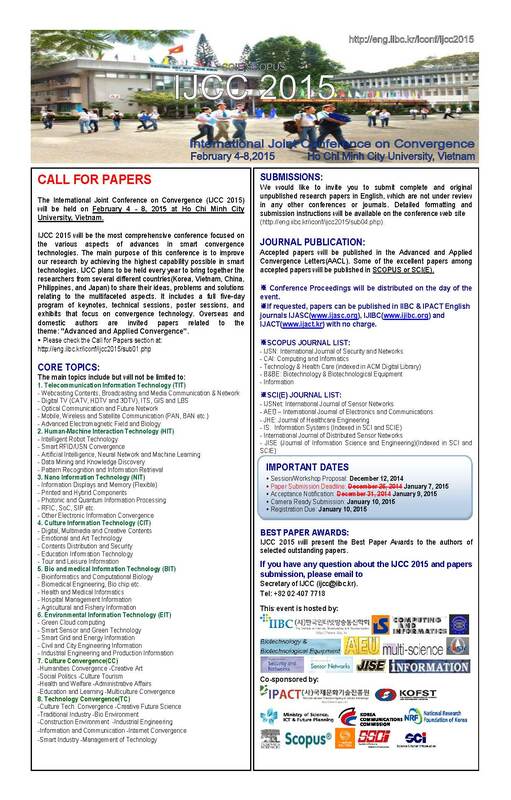 The International Joint Conference on Convergence (IJCC 2015) will be held on February 4 - 8, 2015 at Ho Chi Minh City University, Vietnam. IJCC 2015 will be the most comprehensive conference focused on the various aspects of advances in smart convergence technologies. The main purpose of this conference is to improve our research by achieving the highest capability possible in smart technologies. IJCC plans to be held every year to bring together the researchers from several different countries(Korea, Vietnam, China, Philippines, and Japan) to share their ideas, problems and solutions relating to the multifaceted aspects. It includes a full five-day program of keynotes, technical sessions, poster sessions, and exhibits that focus on convergence technology. Overseas and domestic authors are invited papers related to the theme: "Advanced and Applied Convergence".